Olympia attorney Gerald Steel filed the lawsuit on behalf of the homeowners’ association in Clallam County Superior Court on Monday. The 416-page complaint against Radio Pacific, Verizon Wireless Services, LLC., Clallam County and others asks the court to declare that the Clallam County Building Code Board of Appeals has jurisdiction to hear the association’s appeal of Warren’s decision. 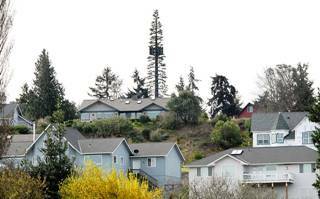 A 150-foot tall cell tower disguised as a Douglas fir tree looms over the Dungeness Heights neighborhood north of Sequim.